An artist whose work is frequently characterized by an abiding interest in consumer culture and the aesthetics of excess, LAURA KIKAUKA has been actively performing and exhibiting installation work and electro-mechanical sculpture since the early 1980s. Kikauka’s “Funny Farm” live-work spaces in Meaford, Ontario and Berlin, Germany have formed the basis for exhibitions. “Funny Farm” has, for example, been represented in parallel with Kurt Schwitters “Merzbau” in venues such as Haus der Kunst, Munich; Sprengel Museum, Hanover; and in other versions at Hamburger Bahnof, Berlin; Schirn Kunsthalle, Frankfurt; MAK Vienna; DNA Gallery, Berlin; and the Power Plant, Toronto. 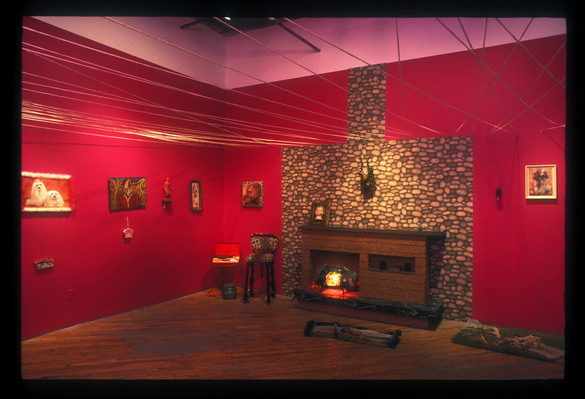 Spanning multiple genres including sculpture, video, sound and photography, these room size installations combine consumer products, sound and electronics to raise questions about taste, consumerism, collections, and consumption. Bringing humour, sarcasm, parody and empathy to her work, Kikauka has exhibited internationally.